An exhibition of sculptor-monumentalist Tokay Mammadov has opened in Baku Museum Center. The exposition marks the 90th anniversary of sculptor, Trend Life reported. Azerbaijan's eminent sculptor-monumentalist turned 90 on July 18, 2017. Addressing the event, Deputy Culture and Tourism Minister Adalat Valiyev, Chairman of Azerbaijan Union of Artists Farhad Khalilov, People's Artist of Azerbaijan, Fuad Salayev, Vice-Rector of the Azerbaijan State Academy of Arts, told about the work of the master who made a significant contribution to the development of the national monumental art. Speakers also stressed that he had brought up a large number of young sculptors and contributed to the development of the Azerbaijan school of sculpture. Then the participants of the event got acquainted with the exposition, which included sculptor's works, photographs of his monuments and the personal archive of the national artist. With great interest, guests of the evening examined artist's works. Tokay Mammadov is the first of sculptors, who received the title of Professor. He has a personal workshop in the Academy of Arts, which was established in 1991 on his initiative. Over the decades, he trained many young talented sculptors. He is the son of the first woman-sculptor of Azerbaijan- Ziver Mammadova and Habib Mammadov - candidate of technical sciences. After getting secondary education, he entered Baku Technical School of Arts and in the third year, in 1945, he was admitted to sculpture faculty of Saint Petersburg State Academic Institute of Arts, Sculpture and Architecture named after I.E.Repin. Tokay Mammadov started with the creation of sculptural portraits. He doesn't like to work on photography, preferring to study living nature. 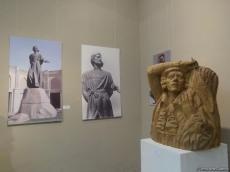 The sculptor created a whole gallery of sculptural portraits of outstanding personalities, including artist Latif Kerimov, orientalist Mirza Kazimbay, Uzeyir Hajibeyli, longevity Shirali Muslimov, a legendary scout Mehdi Huseynzade, artist Mirza Ibrahimov, Niyazi, a poet Suleyman Rustam surgeon Miri Javadzadeh, composer Khayyam Mirzazade and many others. The artist was one of the first Azerbaijani sculptors who began to work with wood and since then it became his favorite material. In different years he created on wood the portraits of many poets, statesmen and ordinary workers.